Mad Dog Albert & Funky Azriel return! 20 years ago(! 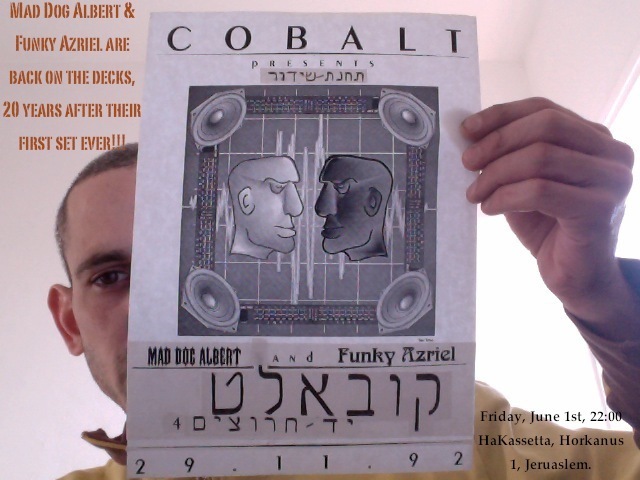 ), my good friend Dany Azriel and me were invited to play a set at the Broadcasting Station line — perhaps the first ever real dj slot in any local bar, hosted by Jerusalem’s legendary Cobalt bar. Now, in case you didn’t feel like showing up in 1992, we’re back and we’re armed with the same mixture of industrial, dub and electronica (expect lots of Wax Trax! and On. U-Sound). Next time we’ll do it will be 2032.